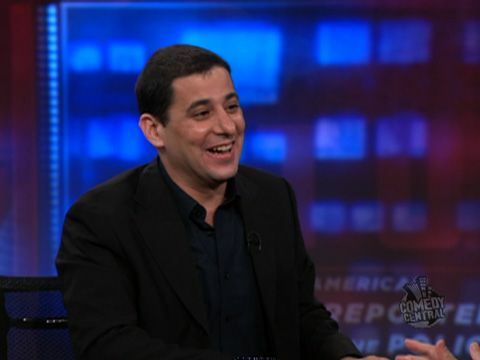 The other night I had the pleasure of meeting the author Jake Adelstein (pictured here on the Daily Show) who wrote the sensational book Tokyo Vice, the story of his time as a crime reporter in Japan. This absorbing memoir traces his path from Sophia University student to full-time reporter at the newspaper Yomiuri Shimbun, a notable feat for a foreigner. He spent 12 years covering the underbelly of Japan, and as expected the bulk of his talk concentrated on the yakuza. He discussed how this Japanese mafia is known as a second police force, or a necessary evil (必要な悪 or hitsuyou na aku). As tracked by the police they number 86,000 and have 986 front companies in Tokyo. In Japan, there were no organized crime laws until 1992, and even now there is limited wiretapping and no witness protection/relocation, quite different from the States in this respect. Adelstein also highlighted other interesting cultural differences such as the fact that there are even yakuza fan magazines, which have articles profiling members as well as photo essay series with them as subjects! As a crime reporter an important aspect of his job was reading these publications to keep up-to-date on the yakuza world. Several questions from the audience focused on the collusion between Japanese corporations and the yakuza, and Adelstein said that it was highly possible that many companies cooperate with one yakuza group to protect them from others. Also, ex-yakuza are often hired as corporate consultants. This is a timely topic considering the speculation that Fujitsu’s former President was ousted because of alleged gangster ties. According to an article in today’s Wall Street Journal, it has been confirmed that this has been taken to court and is currently being battled over. Following our time in America’s heartland my group and I have since moved to the Bay Area, where we are continuing our study of food safety here in the States. One participant requested that we go to eat at a vegan restaurant, as this is not a common concept in Japan. In fact, one night we had a heated conversation regarding the distinction made between the values of plant/animal lives, as well as the viability of vegetarianism. Veganism was a whole other extreme for them, but as they say, don’t knock it till you’ve tried it. 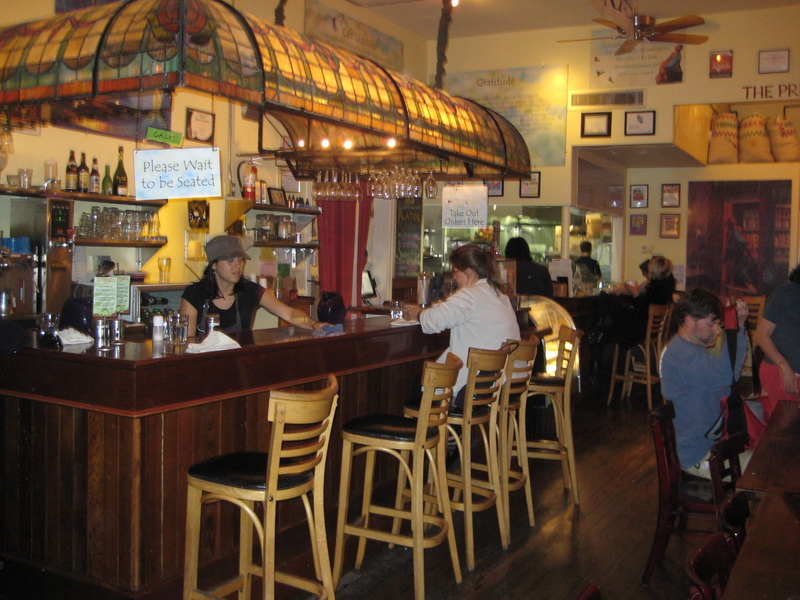 So we were off to San Francisco’s Cafe Gratitude. My participants were surprised at how delicious all the food was despite the limited ingredients. We had a sampler which included various spreads such as olive and hummus, and the red lentil soup of the day which was heavenly. We also shared a coconut curry soup as well as a sweet porridge, followed by nut milk based vanilla ice cream for dessert. None of us had known what to expect going into it, but we all left feeling very satisfied. 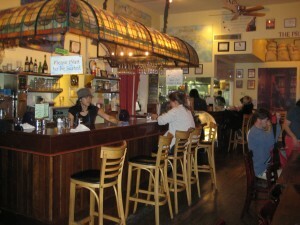 Part of Cafe Gratitude’s premise is, as its name indicates, to increase awareness of what we have to be grateful for. They have a question of the day to stimulate customers, and the one we received was “What inspires you?” Our answers were varied (animals, new encounters, people who try to improve the world) but it certainly got us all thinking. In introducing the restaurant to my guests, I had translated it as 「感謝カフェー」 (kansha cafe). However, they said that if that was the name of the actual cafe in Japan it wouldn’t attract customers as it sounded rather dull. This spurred a whole conversation about what the meaning of 感謝 is in Japan, and both women said that this sentiment is not one that adults would often express, for this would be seen as going too far. Of course it is a component of the pre-meal “itadakimasu” and conveyed either verbally or in correspondence when leaving a long-time position, etc., but it not something that would really be thought about on a regular basis. Here too of course gratitude is something we take for granted, and part of the cafe’s purpose is attempting to remind people of its importance. The participants didn’t seem to think this idea would fly in Japan though, and it was an interesting concept to discuss with them. Personally I find Japanese to err on the appreciative side (i.e. on their birthdays I have friends who thank their mothers for giving birth to them), but perhaps that was a wrongful assumption. On a different note, a recent NYT article about Japan’s “poverty problem” is worth checking out if you haven’t already. It was selected as part of the roundup in the Week in Review section two Sundays ago, and it really speaks to an issue that is receiving significant press coverage as of late. Also another interesting article from the Japan Times talks about the wall Japan has in regard to bringing in foreign talent and internationalizing its own populace. Whereas here in the States today we celebrate April Fool’s Day, April 1st in Japan is a beginning. It is the start of the new fiscal and school years, and the blooming and subsequent falling of the cherry blossoms serves as a way to mark this transition. This morning’s news outlined several changes that will be taking place in accordance with the new year, but whether they will make life in Japan easier or harder remains to be seen. The child allowance law giving parents 13,000 yen per child per month goes into effect today, fulfilling one of the DPJ’s key campaign pledges. It differs from the previous student allowance in that the amount is higher and it lasts until the child finishes junior high, whereas before it was elementary school. In addition, foreign residents who have lived in Japan for more than a year are entitled to the money regardless of where their children live. The party believes this allowance will help families raise their children so much that they hope to double the amount to 26,000 yen per child next fiscal year, though where this money will come from is still undetermined. Will this help remedy Japan’s decreasing birth rate? The DPJ will also follow through on its promise to make education free through high school, whereas before the government only covered through the mandatory education age of junior high. This is the case for public high schools, and families with children at private schools will be able to receive a subsidy of 120,000 yen as long as the curriculum is equivalent to that at public schools. Another incentive for families on the fence about having children. Kanagawa Prefecture introduced Japan’s first ordinance banning smoking in public facilities such as hospitals, schools and government offices. Facilities that are found to be in violation of this will be charged 20,000 yen, and individuals 2000 yen. Governors of seven other prefectures are also considering mapping out their own measures to prevent secondhand smoking, but others have said they expect the central government to enact laws with penalties to prevent passive smoking. Looks like Japan is losing its reign as a smoker’s paradise. And in a look at the past as opposed to the present, an article in Salon yesterday highlighted a documentary made by a Japanese activist exposing the actions of Japanese soliders in Nanking in 1937. This retired teacher seems to be the Iris Chang of Japan in regard to this issue. This doc had its first screening outside Japan in Hong Kong, and I wonder when it will make its way over here. The Wall Street Journal had some interesting Japan coverage this week. One article from earlier in the week discusses tactics being employed to get the Japanese populace turned on to fish again, as its popularity has declined d ue to factors such as smell, price and preparation. It has gotten to the point where fishery officials have started sending instructors to schools in order to teach children how to eat fish with chopsticks, and fish is being promoted in pop culture by characters such as Sakana-kun (on right saying “Let’s eat delicious fish with Sakana-kun!”). Another article focuses on Japanese-Americans who were interned during WWII, and how they got through this ordeal by forming swing bands. This legacy is being preserved through a tribute band called Minidoka Swing Band, with members who were internees as well as others who have no ties to the camps (check out the video, they’re talented!). Speaking of the internment, this weekend was the 3rd annual New York Peace Film Festival which featured some works dealing with this topic. I attended the event’s kick-off party on Friday night where some of the filmmakers spoke. There we had a chance to preview the second part of a movie called “Twice Bombed, Twice Survived,” which depicts those who lived through the bombings in both Hiroshima and Nagasaki. 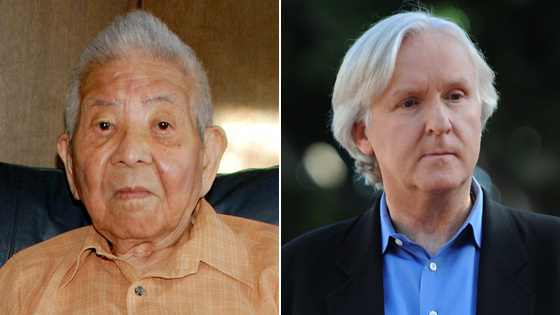 The last known double survivor, Tsutomu Yamaguchi, passed away this January at age 93. However, Hidetaka Inazuka, a producer of the film who was in attendance, said in his comments that another one had emerged just two weeks earlier. This 91-year old man will finally be able to verbalize the horrors he experienced over six decades ago. “Twice Bombed, Twice Survived” detailed how due to survivor’s guilt as well as stigma against these double survivors, many have been reluctant to come forth or even discuss their experiences with their families. .
Also appearing at the kick-off as a guest speaker was Charles Pellegrino, author of the controversial book Last Train to Hiroshima which featured Yamaguchi. The allegations against him of falsifying information cannot be proved as the source in question has already passed away, but Pellegrino asserted that he only wrote what he had been told. Director James Cameron bought the film rights to the story, and when asked if Cameron has any plans to do a movie based on the topic Pellegrino responded by saying, “He’s a busy man and Avatar 2 looks like a very likely possibility, but when the time is right I know he is still interested.” Cameron was able to meet with Yamaguchi before he passed away, and the double survivor’s dying wish was for Cameron to share what happened in Hiroshima and Nagasaki with the world. Japan has a huge selection of seasonal goods, with new candies and drinks hanging around for a only a few weeks, then disappearing as suddenly as they arrived. One such candy is Kit Kats, with many unusual flavors being released each year. 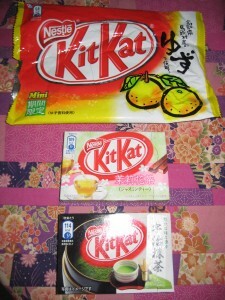 Read this post for reviews of ginger ale, azuki (red bean), Uji maccha (green tea), jasmine, and yuzu (grapefruit) Kit Kats. A post about a recent talk given in New York about loneliness in contemporary Japan. Issues “include karo-jisatsu (suicide by overwork), sekkusu-resu (sexless marriage), kateinai-rikon (in-house divorce) and hikikomori (complete social withdrawal).” An article in the New York Times noted that sometimes those suffering from depression simply have no one to talk to about their problems, and turn to suicide as the answer. 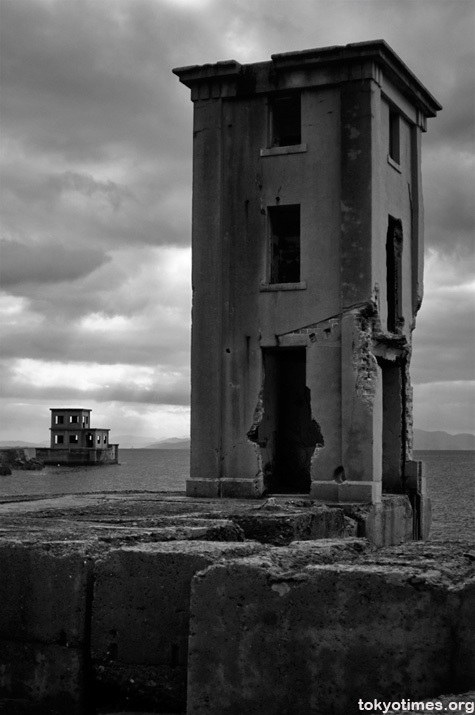 A haunting photo essay of a visit to the abandoned Japanese Navy Torpedo Boat Training School in Kawatana, which dates to WWII. “Special Attack Units” in Japan referred to all manner of suicide soldiers, including Kamikaze (“Divine Wind”) pilots, Shinyo (“Sea Quake”) speed boats, Fukuryu (“Crouching Dragon”) divers, and Kaiten (“Change the World”) torpedoes. The last three were all trained at Kawatana in the late days of the war in a desperate effort to defend Japan from a potentially devastating invasion. 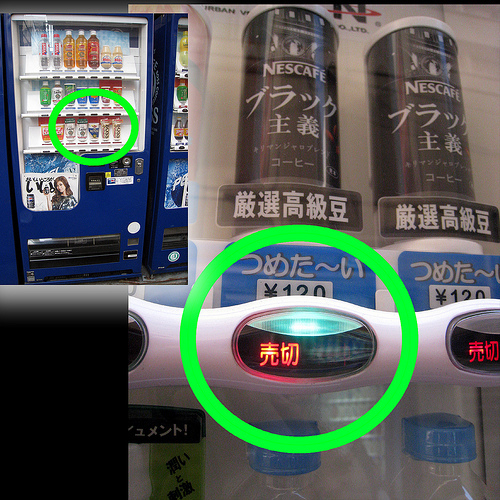 Ah, the ubiquitous Japanese vending machine. From hot coffee to tea, cigarettes to beer, and flowers to fresh eggs (yes, seriously), there are plenty of vending machines for whatever your desire. Need batteries late at night? There’s a machine for that. Need instant ramen? You can grab that, too. Check out this helpful kanji tutorial to learn what you need to know to get your item NOW. 12/21/09: Can tongue surgery improve English-speaking ability? Really? 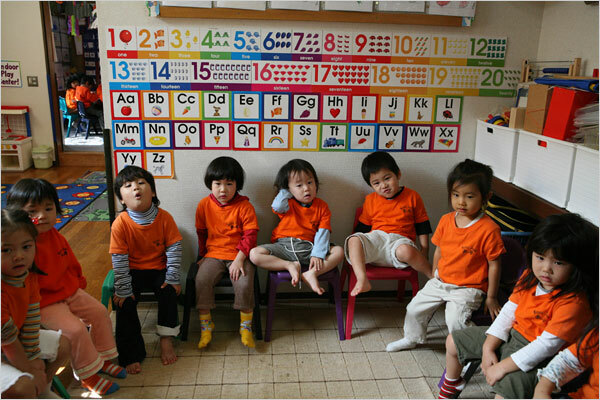 Some parents in South Korea apparently think that their children have difficulty pronouncing English because their tongues are “too short,” so a surgery is offered called a lingual frenectomy. The post points out that the clinical claims of the surgery are dubious at best, and that the length of one’s tongue has nothing to do with what languages you can and cannot pronounce (well, unless your tongue is missing or cut terribly short). A later post talks about another surgery in South Korea that will alter the lines on your palms with lasers to make them more “auspicious.” Bizarre. The Japan-China Joint History Research Committee, composed of scholars from both countries, cannot agree on the Nanjing Incident in terms of the number of victims, or even reasons for the Second Sino-Japanese War. Unsurprising, but it doesn’t make for a very useful report. Coverage of an article in the Yomiuri about the new Ibaraki Airport that will have no domestic flights, and only one international round-trip flight to Seoul per day. Why was this airport even built? It has been unable to lure domestic airlines, and has become a huge expense for the prefecture. Though knowing the Japanese government, that construction money had to be spent somewhere, even if it was for a useless project. Well, at least it’s not another dam? As mentioned in this post, Japanese police were seeking the arrest of four American teenagers for the attempted murder of a young Japanese woman in what appears to be a stupid prank gone horribly wrong. All of the teens are the children of US military stationed in Japan. Though the military at first refused to cooperate with the Japanese authorities, they have now handed the suspects over. Expect to see more updates as they come in, especially since this was a big domestic story that hit the main page of CNN.com and other news outlets. A post featuring some detailed videos about Tobu World Square and their annual lighting of 42 UNESCO World Heritage Sights painstakingly created in 1:25 miniature (complete with 140,000 mini hand-painted people!). New York landmarks featured include the Statue of Liberty, the Empire State Building, and the World Trade Center towers, which were preserved after the 2001 attacks as a symbol of peace. A clever Japanese music video animated by Sugimoto Kousuke and set to the music of Takayuki Manabe. Colorful, stylish, and great fun to watch! A self-taught robot maker, who is also a marine scientist, has hand-crafted some pretty amazing aquatic robots. Made from recycled items, the robots are remarkably detailed and operate with eerily life-like motion. Pictured here is his 5-foot, 105-pound “masterpiece”: a coelacanth robot. Pretty amazing if you watch the videos in the link! A post about an article in the LA Times about the origins of manga and anime in kamishibai, and kind of “street theater using painted illustrations” popular in Japan in the 1930s. An interesting read for fans of Japanese comics and animation! What the…? Really? The most recent administration of the JLPT (Japanese Language Proficiency Test) Level 1 apparently featured a listening question straight from the Evangelion anime. Helpful if you’ve seen the show, of course, but baffling if you haven’t! Reportedly, quite a few test takers couldn’t hold in their giggles. Level 1 is the highest of the 4 levels of the JLPT, and is obviously pretty tricky. Coverage of the Kurama Fire Festival (Kurama no hi matsuri – 鞍馬の火祭り) which was held on 10/22. People with huge lit torches parade through the streets on the way to the Yuki-jinja Shrine. More pictures and information can be found here. Humorous article on the differences between how celebrity gossip is covered/prosecuted in Japan and in the US. Answers the all-important question: “What’s wrong with being naked?” (quite a lot, apparently). Written by a former JET teacher who is now married and living in Japan. 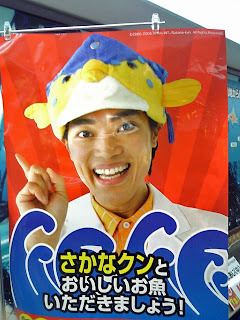 Many towns and cities in Japan have their own mascots used to promote tourism. What do you think New York’s mascot would be? I can think of a few unsettling examples, but a big apple would probably be the most kid-friendly. Another very useful post from Japanese Pod 101. Venture into Japanese grocery stores without fear! This is something I’ve often wondered myself. The best explanation I got while in Japan was, “It’s just something you do in pictures.” This post gives some much more detailed theories as to the origins of the practice. The concept is awesome: glasses that display translations for foreign languages as you hear them (via a built-in microphone). However the reality is not quite up to par since machine translation technology is simply not advanced enough. However the glasses, which are set to go on the market in 2010, could still be used in other situations to display text for workers. The Takarazuka Revue is an all-female musical theater group in Japan that puts on popular adaptations of shows like Guys and Dolls and The Sound of Music. It has appeared in the press again lately since the current first lady of Japan, Miyuku Hatoyama, was once a performing member in the 1960s. I personally heard about it lately since my host mom in Japan saw a performance last week. All male roles are also played by females, often done up like David Bowie-esque makeup. Pictured here is one of their “Phoenix Wright: Ace Attorney” shows. Yes, Phoenix Wright has come to stage! My host mom said the show she saw was extremely over-the-top, but still fun. For more information on this group, check out this link. A robot that shows symptoms of H1N1 was recently displayed at an expo in Tokyo as a training aid for emergency workers. Without treatment, the patient will eventually “die” and stop breathing. Also featured this week was a female humanoid robot named Saya who worked reception at a Takashimaya department store in Tokyo. Pictures of her are slightly creepy (uncanny valley, anyone? ), though she was apparently a hit with shoppers and tourists. At least her appearance isn’t as upsetting as this little guy from two years ago. CB2 will haunt my dreams forever, though all these advances in robotics are still certainly impressive! I guess I should have realized this earlier, but it was still a little shocking to think of the famous deer of Nara having their antlers sawed off on a yearly basis. However, the deer have no feeling in their antlers by the time of the ceremony, and they are usually naturally shed each year after mating season anyway. The 300-year-old ceremony is performed for the safety of both the deer and the tourists who flock to Nara to feed them “shika sembei” biscuits.